Spotify has a lot of buzz and a bunch of users, but it’s not a mainstream service by any means. 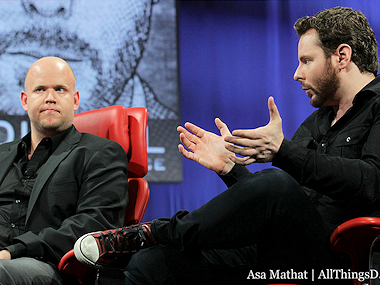 So think of today’s D10 interview with CEO Daniel Ek and investor/adviser Sean Parker as a Spotify primer: Walt Mossberg got the two men to explain exactly how the streaming music service works, and why they think it’s going to be a truly big deal. The big idea: You can listen to the service for free, on your PC, with some limited exceptions. But if you want to take your music with you on an iPhone or Android, you’ll pay for the privilege. “People pay for portability when it comes to music, and they’ve always done it,” Ek argued. This model spooked the big music labels for some time, because they worried that Spotify users would stop paying for music. But Spotify says many of its users stopped paying for music a long time ago — they were stealing it. A Spotify customer, they argue, isn’t a lost iTunes buyer or a lost CD buyer — it’s a converted pirate. That said, people in and outside of Spotify have argued for some time that Apple in particular was not happy to see Spotify’s rise, and today Parker finally talked about that out loud. “There was a sense in which Apple was threatened by what we were doing,” he said.